I just slapped a shiny ribbon on House Einstein's latest research. It's the annual report on Boulder Real Estate. Didn't get a copy? It's easy to sign up. Just click HERE. House Einstein's annual report covers Boulder, Lafayette, Longmont, Superior, and Louisville real estate markets. 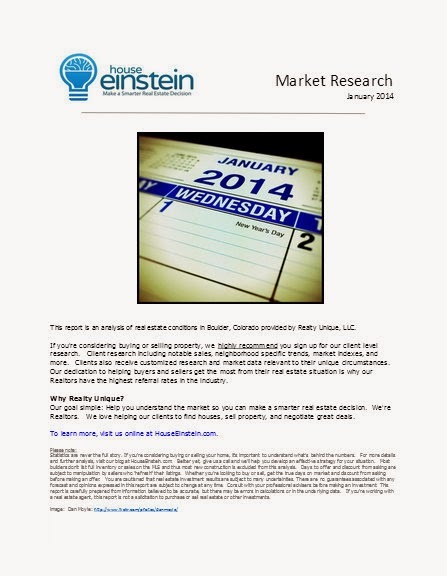 The analysis includes days on market, inventory, sales volume, pricing, and more. You won't find this unique research anywhere else. it's the most up to date and detailed information on real estate conditions available, period. As Muhammed Ali once said, "It's not bragging if you can back it up."